Former Newcastle and Eagles striker Shola Ameobi has signed a one-year contract with second-division Turkish club Gaziantep Buyuksehir Belediyespor. The Nigeria international, 32, was a free agent following his departure from St James' Park, where, after graduating from the academy, he had been a first-team player for 14 years. "We want to establish an ambitious team in the league this season, and a strong team continues to strengthen by adding players," said a statement on Gaziantep's official website. "We have therefore tied Nigerian striker Shola Ameobi - from one of the strongest teams in England, Newcastle United - to us for one year." 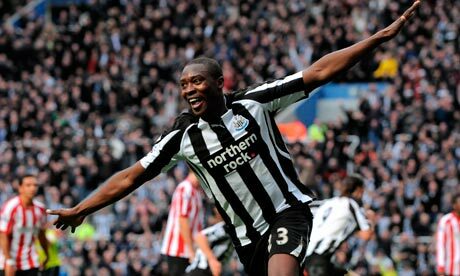 Ameobi made 312 appearances for the Magpies, scoring 53 goals, but much of his career on Tyneside was plagued by injury and inconsistent form. He scored Champions League goals against Barcelona in 2002 and against Bayer Leverkusen the following year, while his best return in the Premier League saw him score nine goals in 2005-06. Ameobi's 11 goals in 21 appearances helped Newcastle win promotion from the Championship in 2010 but he steadily became a fringe player as boss Alan Pardew re-established the club in the top flight. Gaziantep, who are currently managed by Suat Kaya, finished in 14th place in the TFF First League - the league below the Turkish Super Lig - last season.